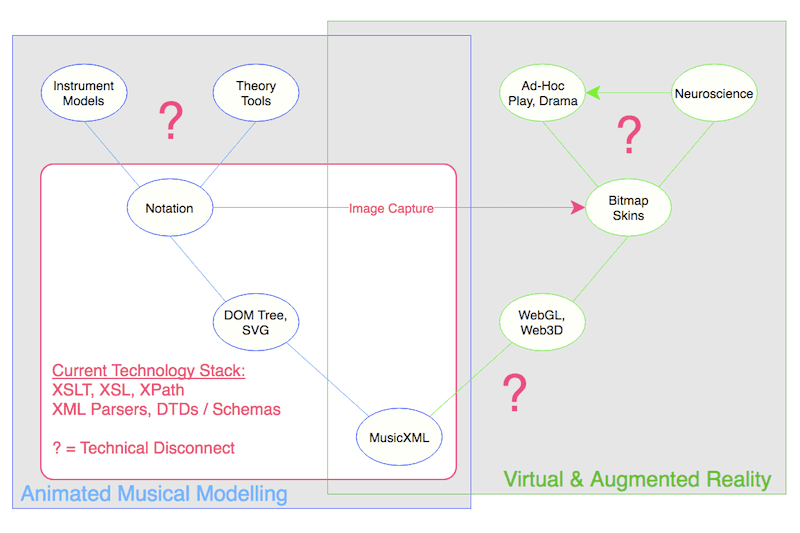 Music Visualisation Aggregator Platform: How Does It All Work Together? World Music Visualisations: Paradigm Change? Musical Modelling: Physical-Mathematical, Test-Based or Rule of Thumb? Music notation has at first glance been thoroughly commoditized. Whether using browser DOM (SVG) or WebGL (Web3D), the future seems to lie higher up the value chain - in music visualization. The motivation is simple: musicians 'hear' the written note, learners seek visual models. Why is browser-based music visualization having such a hard time taking off? 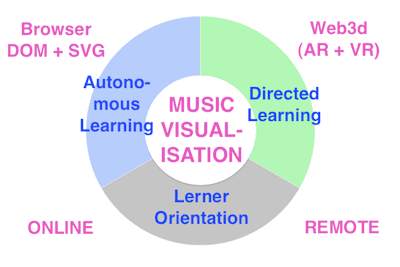 Why only muted interest in web-based augmented and virtual reality (Web3D) music learning applications? 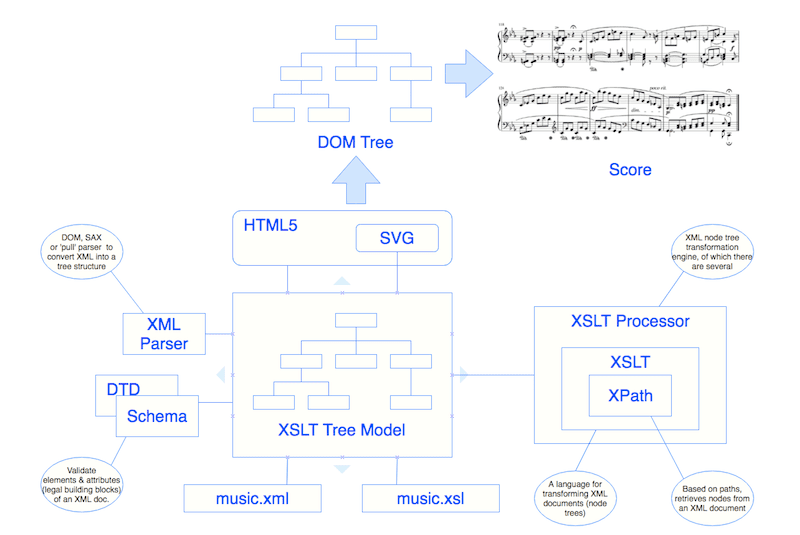 The XSLT constellation has until now been viewed as the 'go-to' technology for MusicXML processing. It's claimed clean, well-proven, reasonably quick and elegant. (Disclaimer: I've never used it -> 'popup expert'). Sluggishness of progress in both of the above areas, however, suggest a problem in the current technology stack - one or more technical disconnects somewhere among the most widely used exchange format, MusicXML, the technologies used to build SVG or Web3D models, and those used to manipulate them in the browser. Could this obstruction lie -at least in part- in the very technology widely being used to generate notation in the browser? XSLT forms the base of a set of software libraries widely used to transform MusicXML into SVG (a language describing sophisticated graphics of use with the browser DOM (Domain Object Model). In this post, we try to identify any disconnects, figure out where the benefits of the XSLT technology constellation end and possible impediment begins, and, as exemplified by the banner image above, explore a powerful, data-driven alternative. In data visualization, the terms 'transformation' and 'transition' are often (and wrongly) used interchangeably. Transformation refers to a conversion of data container format (such as from MusicXML to SVG, our focus here), or of the end properties (position, size, shape, color, viewpoint or scale) of a graphical screen object following application of a deterministic function to each point in it's underlying data set. Transition, on the other hand, describes an action itself (the deterministic function) used to achieve a transformation. Several transitions may be employed (chained) to achieve a transformation. 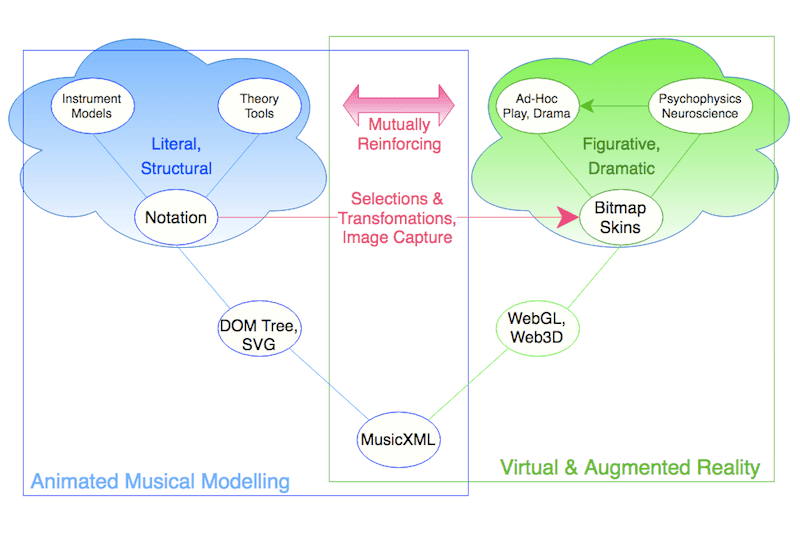 We looked (in separate post) at the shared role of MusicXML in the 'literal' DOM/SVG vs 'figurative' WebGL/Web3D worlds, and how imagery captured in the former could be repurposed in the latter. Because it offers such a huge spectrum of opportunity for online social value delivery, this constellation should be the first focus of anyone working towards solutions in music teaching or learning. With MusicXML as standard or default exchange format at the root of current score-building capabilities, in a browser DOM context, we currently have a choice between at least two clearly differentiated open source technology stacks. The XSLT specification defines XSLT as "a language for transforming XML documents into other XML documents" - of which both MusicXML and SVG are widely-used examples. Perform a musical transformation, such as transposing the music into a different key or extracting parts for different instruments or voices. Capture music from non-XML formats and translate it to XML (XSLT 2.0 is especially useful here). 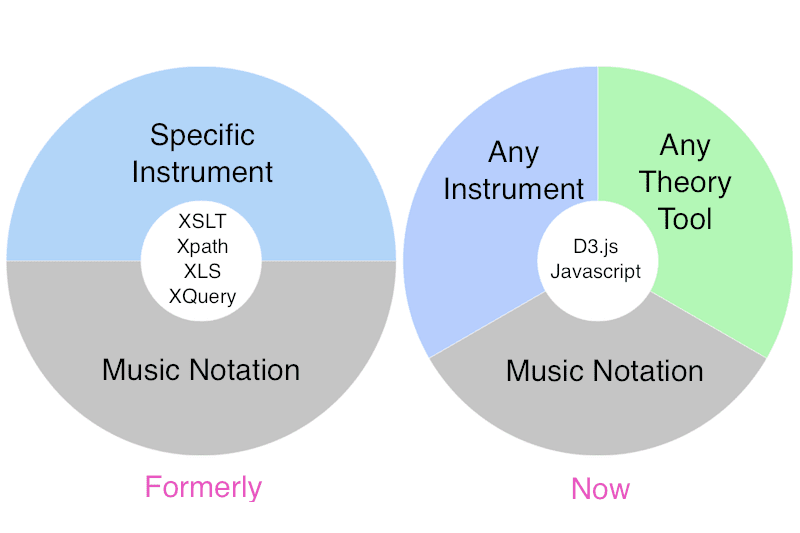 So, basically from more or less anything to XML, and from XML to more or less anything..
With MusicXML adopted as a W3C standard for music exchange, XSLT and it's suite of tools (XSL, XPath, XQuery etc) have attained the status of a transformational music technology. With XSLT's help, the marriage between MusicXML and SVG notation has, you might say, been made. There are others approaches, but these tend to focus (using, for example, Domain Specific Languages, or DSLs) on expressing the underlying structures of music more succinctly, in the end offering a level of visual interactivity only marginally different from what is already available using XSLT. According to Interactive Data Visualization for the Web, D3 is intended primarily for explanatory as opposed to exploratory visualizations, the latter of which help you discover significant, meaningful patterns in data. This is an important distinction - and one that our layered, highly flexible configuration processes for instruments and theory tools modeling is (with D3.js help) intended to overcome. Parsing in a D3.js context is layered process concerned ultimately with the creation of direct, graphical bindings. Parsing of MusicXML, however, is a fairly complex and layered process aimed at transforming serial data into timeline-based parallel parts and voices. Moreover, as hinted at above, we want both parsing and any resulting SVG notation generation done on the server, leaving only it's manipulation (transformation during, for example, playback) in the browser. It's somehow telling that XSLT barely features in reviews of, or searches on, tools for data visualization. This is only reinforced by the fact that XSLT's role in music seems to have been capped at the level of notation. XSLT's potential should, logically, at least extend to the generation and driving of complex, score-driven, exchangeable, time-synchronized and highly interactive on-screen visual SVG animations. XSLT certainly facilitated the creation of beautifully typeset notations in a wide variety of fonts, but possibly at the cost of interactivity and flexibility. 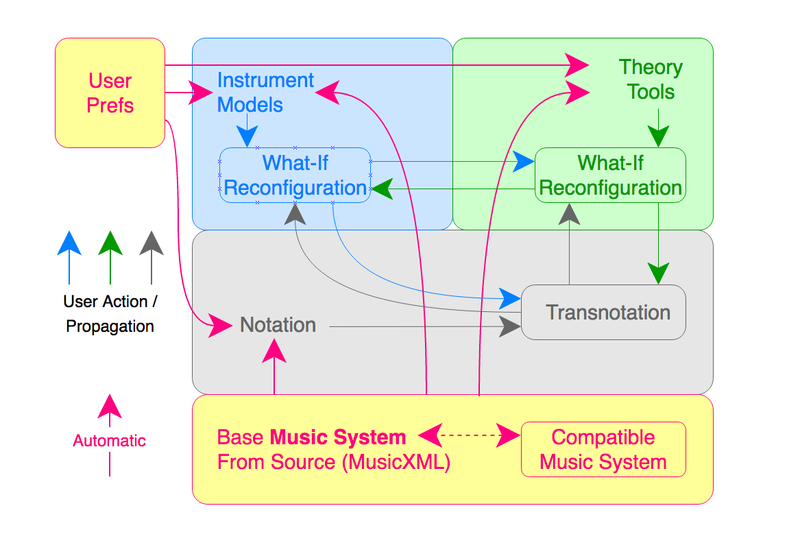 Where any instrument / theory tool disconnect might be attributed to technical complexity, MusicXML's use in the Web3D provisioning chain is still in it's infancy. I have seen it claimed there is currently no great interest in WebGL music applications. Given the size of the music learning industry, I find this difficult to believe. What seems more likely is that no-one has yet been able to formulate a technical concept bridging the gap between MusicXML and WebGL. "Extensible Stylesheet Language Transformations (XSLT) is another declarative approach to document transformation. Source data is encoded as XML, then transformed into HTML using an XSLT stylesheet consisting of template rules. Each rule pattern-matches the source data, directing the corresponding structure of the output document through recursive application. XSLT’s approach is elegant, but only for simple transformations: without high-level visual abstractions, nor the flexibility of imperative programming, XSLT is cumbersome for any math-heavy visualization task (e.g., interpolation, geographic projection or statistical methods)'. "Cumbersome". Mmm. These remarks (admittedly made before the release of XSLT version 2.0) have profound implications for music visualization, the missing 'visual abstractions' referring to the direct and locally manipulable bindings between data and (say) SVG. Interpolation weaknesses are presumably mentioned because they form the basis for smooth (jitter-free) animations. There have of course been substantial improvements (explored further below) since then. As of 2010, for example, all leading browsers support client side XSLT transformation. The question is how close these come to the direct data bindings of D3.js. Transforming MusicXML into SVG notation according to embedded time tags is an area where XSLT implementations still seem to have the upper hand. The XSLT Programmer's Reference suggests that one of the benefits of XSLT is "separating (decoupling) data from presentation", in practice achieved by each different stylesheet rendering data in a different way, and resulting in 'one data source, multiple resulting formats, and conversion between the formats'. The moment data and presentation are decoupled in a music visualization context, however, we invite a number of issues: synchronization drift between audio and visual elements, less directly accessible data, data fragmentation (and hence a greater likelihood of duplication). The best guarantee of audio-visual synchronization, on the other hand, is to keep sound and image generation intimately bound to the unique underlying data, and directly associated with hardware timers. Using D3.js, this is pretty straightforward. With the XSLT approach, however, each product format -whether data or document- is effectively a silo. This may be a valid requirement in an MVC environment where the application is in control of presentation (one set of data being tailored for example to mobile vs desktop use, a conventional hierarchical web site, the peculiarities of individual browsers, or simply different user roles), but is inappropriate in a data-driven scenario, where data and it's (sometime multiple) usages are closely bound, the resulting presentation type, whether audio, music notation (essentially a scatterplot), tree, choropleth, map or bar graph is under direct user control. This disconnect would also conflict with our layered approach to instrument and theory tool configuration, where a change at a lower level (the scale length of a stringed instrument, for example) impacts everything (tunings, fret positions, fingerboard roadmap etc) above it. 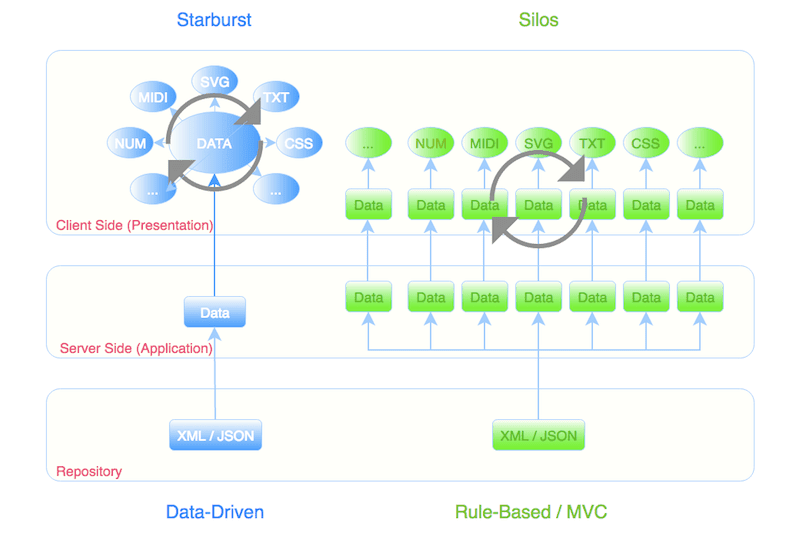 The XSLT stack, then, remains suited to rigorously targeted B2B (business-to-business) communications, allowing conversion between a variety of document formats, but less so to reusable and extendable musical animations and the ad-hoc control actions of users in a shared, P2P (peer-to-peer) music environment. Both XSLT and D3.js rely on an XML parser to convert the XML document into a tree structure. Where XSLT and D3.js differ, however, is that XSLT is designed to navigate an own tree modeled from XML, whereas D3.js is used to directly navigate the browser's DOM tree. These models, though similar, are not the same. Indeed, the XSLT approach results in two distinct tree models on the way to an SVG display - with additional processing overhead. In both cases, however, we might be forgiven for expecting the final results to be broadly similar. I have no experience with XSLT, but one thing in particular sounds an alarm: MusicXML has in recent years come to cater to hard-coded music glyph positioning information in MusicXML files. This suggests one of two things: either XSLT does not lend itself well to scalar (algorithmic) positioning, or -however this positioning is calculated- it tends, in certain situations, to break down. This is strange for one simple reason: best musical typesetting practice is a long established and well documented skill. Time division ('div') information contained in MusicXML should, in combination with the accumulated notes at any given position, be entirely enough to satisfy scalar/algorithmic positioning - in both the horizontal and the vertical. 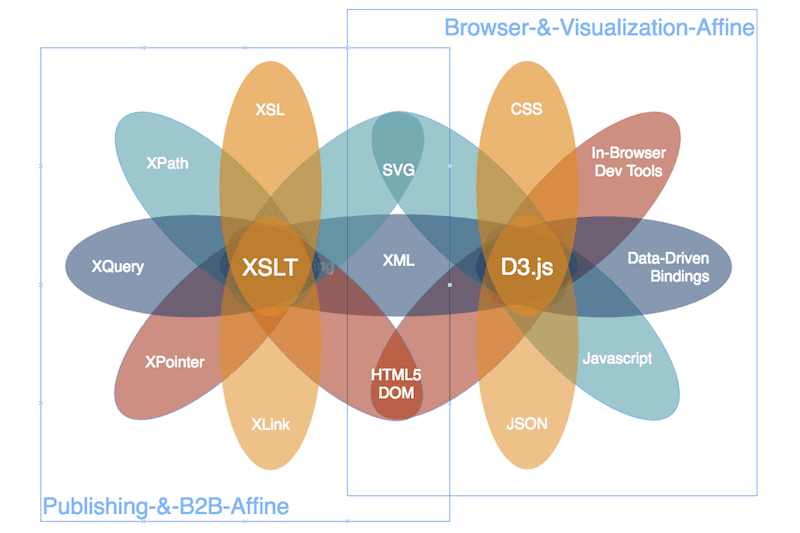 XSLT is one of a few close analogues of D3.js. Both are document transformers, or 'visualization kernels'. XSLT, a declarative language (describes not how to do a task, but what to do) with templating capabilities which lend it some functional characteristics. D3.js -a functional programming language- looks vaguely imperative - but it's behavior is feels declarative.. Many existing notation systems are built on an XSLT foundation, so in theory much of the work involved in readying music exchange files for new applications (in areas such as in-browser, SVG-based music visualization, or WebGL-based augmented or virtual reality web applications) may well already have been done. D3.js integrates well with some declarative languages used in the emerging WebGL field. XSLT has no particularly visible footprint in this area. D3.js's focus is on achieving behaviors proven across most major browsers, tending to blend out any behavioral abnormalities. The XSLT ecosystem, on the other hand, tends towards a perfect result in each individual browser. Lastly, working with XSLT is eased using proprietary XML authoring and execution software, whereas D3.js code can be written and debugged using any of many open-source SDKs in conjunction with the browser's inspector. Because of their close data-to-DOM bindings, data-driven applications respond instantly and dynamically to changes in a data set. Though XSLT is already a declarative language (describes what you want to do, rather than how to do it), can it really be considered data-driven? Given it's expressive shortcomings ("cumbersome") compared to D3.js, on certain types of client-side transformation, it may be obliged to rebuild some presentation structures from scratch. Here, I wish I knew more. it is claimed you cannot reassign a variable's value once set during runtime. NOTE: This limitation appears to have been eased in XSLT 2.0 and 3.0, through functions - also, incidentally, easing bindings to other languages. in some cases, design choices limit the finished SVG's use as a data source - e.g. SVG overlaid with bitmapped zones allowing scoping and control (e.g. definition of looping bounds). In effect, the technology, while suited to document generation, may not be so suited to the dynamics of data visualization - and especially where these are driven from a musical timeline. Effectively, every time an XSLT rule is fired, presentation elements are rebuilt. This would be especially telling in an environment such as ours, where user-led dynamic configuration is an issue. Let's explore this possibility a little further.. Conceptually, XML parsing can be thought of at two distinct levels: the trivial level of simple XML data extraction (answering questions such as 'how many times does 'xxxx' appear in the file'), and the more complex re-ordering and positioning of elements according to some other, 'higher-level' dimension (such as MusicXML's 'div' timeline). To use D3.js to generate musical notation using SVG, then, we are obliged either to select from and transform the SVG output of existing XSLT solutions, or parse MusicXML from first principles. With complex (and in a sense recursive) time dependencies in MusicXML, the latter is a non-trivial task. The raw material of data visualization libraries such as D3.js are arrays, often the product of parsing a large batch of data in a text format such as JSON. With complex data sets, these can result in array scaffolding, where the value found at a given index in one array acts as index to another. The arrays are, in this sense, interlocking. Were we to visualize such interlocking arrays, we might see something like the following. 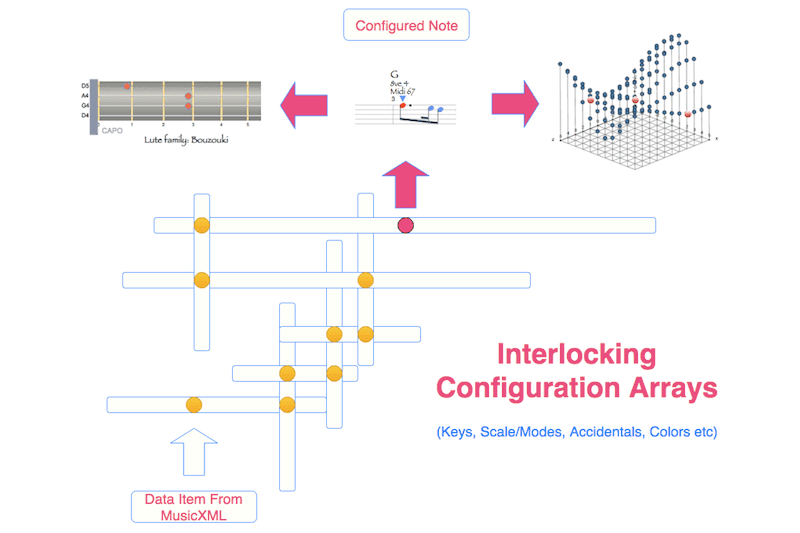 From the contents of a MusicXML file, interlocking arrays (representing key, number of parts and voices, instrument types, number of notes in an octave and their individually assigned color codings) build a lattice ultimately spitting out the algorithmically generated position and dimensioning characteristics not just of individual notes, but of entire, populated voice, part and other sections. Choosing a value from an array (such as number of notes or tones per octave) may resolve several dependencies. For example, having resolved the modular base and temperament or intonation (12 for midi, i.e. western or classical equal temperament, but there are many others in use worldwide), we can determine which color scales to use, the fret layout of a lute family instrument, which modal scales apply, and the spatial relationships in a lattice or tonnetz theory model. Feeding off these arrays, D3.js builds, layer for layer on the server side, interface components (some hidden, some visible) which can be grouped and/or assigned classes and ids for subsequent (client-side) selection purposes. Based on these selections, be they of part, voice, phrase, bar, notes at a particular time division or indeed individual notes, a wide range of visually enthralling transformations can be made. These have (potentially) huge implications for the ad-hoc, labyrinthine and on the whole more dramatic visual narratives of WebGL. Here we see two types of configuration change in action: the defaults, driven both by the musical source (here MusicXML) and user default environment settings, and any directly user-controlled and propagated 'what-if' type changes. Already this simple scenario opens up huge potential for musical exploration: comparing instrument configurations, 'best-try' fitting of notations to instruments from a different musical (configuration) culture, comparing theory tool specializations etc. These are explored in more detail in a series of more recent posts, but the point here is that they are enabled by and built on a data-driven base. XSLT And D3.js - Together? XSLT is powerful tool in the parsing and transformation of MusicXML, D3.js in creating direct data-to-visualization binding and transformations. All this prompts the question whether, using XSLT, rather than decoupling, you can aggregate data into the published SVG where it can be accessed and processed by more powerful selection and transformation libraries. D3.js has, for example proven, itself perfectly capable of integrating with Web3D declarative languages, so perhaps there is scope here for some data-driven magic. Clearly, to integrate a library such as D3.js with the product of notation created with the XSLT suite is going on the one hand to require considerable knowledge of both domains, and on the other a presents a high analytical and naming harmonization entry bar. Perhaps the most compelling argument in D3.js's favor, though, lies in the area of P2P (peer-to-peer) interworking in online teaching and learning. D3.js provides for a level of fine-grain, highly flexible selection and transformation control difficult to achieve in any other environment. Indeed, it's selection and transformation capabilities are, in comparison to XSLT, simply spectacular. Big, brave, open-source, non-profit, community-provisioned, cross-cultural and batshit crazy. → Like, share, back-link, pin, tweet and mail. Hashtags? For the crowdfunding: #VisualFutureOfMusic. For the future live platform: #WorldMusicInstrumentsAndTheory. Or simply register as a potential crowdfunder..
W3C web standards focussed (tightly integrated with Browser DOM and technologies). In sum, the core issues with XSLT seem to be the lack of direct data bindings (direct manipulation of the document object model), XPath/XQuery is no match for D3.js's powerful selection, transformation and transition capabilities. In a MusicXML or other exchange format context, these have impact both in a 'vertical' (immediate visualization control) and a 'lateral' sense (P2P interworking). In particular, powerful selection capabilities open up the possibility of activating different selection sets depending on learning needs: for example on the horizontal within a score, controls for playback and looping, in the vertical within a score, controls for note and interval identification. Comments, questions and (especially) critique welcome. Music Visualisation: Why a platform, not just an app? Why No Classification System For Music Theory? © Copyright 2015 The Visual Future of Music. Designed by Bloggertheme9 | Distributed By Gooyaabi Templates. Powered by Blogger.